The Central New York Regional Market Authority has opened a new multipurpose facility in Syracuse, N.Y., for its year-round farmers market and other events. The facility is a hybrid fabric-steel structure. 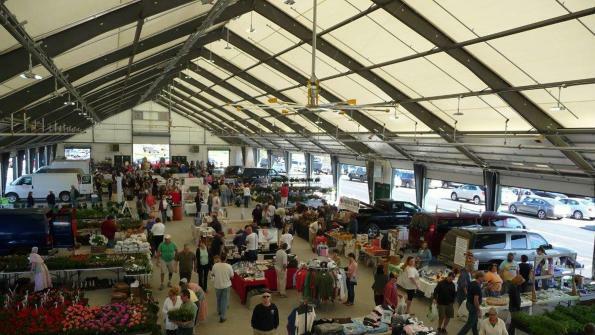 The Central New York Regional Market Authority (CNYRMA) has opened a new multipurpose facility in Syracuse, N.Y., for its year-round farmers market and other events. The hybrid fabric-steel structure was custom designed, engineered and erected by South Haven, Minn.-based Legacy Building Solutions. Due to challenging soil conditions on the market site, CNYRMA needed a custom solution for the new facility. The new structure is a customized tension fabric building on a durable rigid frame. The building’s fabric roof allows plenty of natural light to permeate the interior during the day, while an LED lighting system is in place for evening use and the structure’s included offices. Legacy’s clearspan design allows for the entire floor space to be used. Farmers, vendors and customers have easy access through 18-foot-wide, high-lift overhead doors in the sidewalls and R/U-insulated overhead doors in the end walls. An active circulation and exhaust ventilation system enhances air quality. The structure also has passive ventilation in the soffit and peak. Additionally, a wet sprinkler system and heating units are suspended from the ceiling, while the roof features a 3-foot eave overhang with icebreakers. The tension fabric roof is rated for 90 mph winds, 50 PSF (pounds per square foot) ground snow and 33.5 PSF roof snow. Roof studs were also placed for the future addition of solar panels. The CNYRMA was created by the New York state legislature in 1938. Legacy Building Solutions specializes in the design, engineering and construction of fabric-covered buildings for a variety of industries and applications. This video shows how the manufacturer combines fabric technology with the advantages of pre-engineered metal building frames, to deliver a structure with clear spans that meets a variety of needs.